Internet is now virtual home to a quarter of the World population. 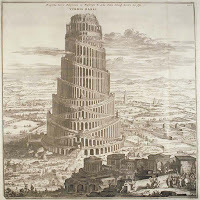 Modern Tower of Babel, 1.5 billion people communicate through Internet in countless languages. Almost 500 million communicate in English, 300 milion in Chinese, 120 million in Spanish, 100 millions in Japanese, 70 million in both french and Portuguese, 60 million in German, 40 million in Arabic, Russian and Korean but also 250 million in a large number of other languages. Domain Names give access to around 2 trillion pages being seen every month. Since the beginning of the World Wide Web adventure, a little less than twenty years ago, 156 million domain names have been registered. But less than half only are estimated to be in use : around 65 million are active, and every web user visits on average 66 of them each month. Blogs (from 'Web log'), appeared in 2002. There would be 150 million of them today, but only 7.5 million were updated in the last 120 days, 1.5 million updated last week, and 1 million in the last 24 hours ! Today blogs seem to be divided in two large categories; less active 'personal pages' blogs on one hand, more active and more 'professional' blogs on the other hand, the latter being increasingly advertising- and profit-driven. Many of the most active blogs today tend to be oriented towards products' and services' advertising. Despite strong values of consumer protection and information being present in bloggers communities (usually adults from 25 to 40 yrs old), ties between bloggers and brands are even more frequent and driven by self-interest. Social Networks and Community Websites today have around 250 million active members and more than 600 million 'one-time' visitors, making up 40% of Internet users ! Concentration is to say the least high with two networks, MySpace and Facebook, representing 70% of this global phenomenon. They have a dominant position in all but a few countries (China, Japan, Brasil). Active members are young - only 20 % under 40 -, their first motivation 'to stay in touch with their circle of friends' (for more than 80%), then 'to share their interests and hobbies' (51%) and 'to meet new people' (48%). One can envisage that the maturing phenomenon may consequently lead to some more diverse and distinctive thematic 'micro-communities'. Wikipedia plays an exceptionnal role in the participative world : close to 700 million visits in 2008 of the 10 million articles in 250 languages shared by 75,000 contributors since 2001, building this amateurs' encyclopedia. But a closer look to the Wikipedia story shows that some kind of 'professionalisation' was self-born in Wikipedia; hence, in this project open to 'all', 524 people, or 0,7% of users are doing 50% of the site modifications and only 2% of active users have achieved, the 1,400 of them, 73% of Wikipedia since the beginning! Same story for another hugely successful 'collaborative' network, Digg.com, where 20% of articles making it to the front page come from a selective group of around two dozen people (5,257 articles out of 25,260). The top 100 'diggers' pushed 14,249 articles to the Front-page, 56% of the total ! With Twitter a new development seems to unfold today, leading the Web towards more simultaneous communication. This blend of social network and micro-blog proposes a new form of communication, re-drawing the map of information. The participative Web (Web 2.0) offers a great opportunity to the "Citizen of the World" to cross the borders of traditional public space, and to re-invent his relationship with public powers and sciences. Will He take his chance ? Many past experiences show this kind of dynamics is often eventually 'framed' and used for commercial purposes. Their influence is nevertheless very noticeable on the schools of thought, on the interactions between producers and consumers, institutions and electors, media and readers, re-distributing a hand where individual expression counts more and so at every instant. The evolution of public opinion surveys and of opinion polls is closely related with the historical progression of universal suffrage. In fact the first movements toward universal suffrage occurred in the early 19th century, at the very time where the first opinion polls were born. Until then, the only model where some experiment of direct democracy prevailed was the city-state of Athens. For thousands of years the idea of democratic referendum was forgotten, decisions being made by wealthy and scientific elites, until new means of communication led to revolutionary changes in decision systems; the development of mass printing and the emergence of a larger "enlightened" audience allowed new democratic reflections to spread, up to the French and American revolutions and the birth of universal suffrage. In parallel, major advances in the scientific world would be the germ of public opinion analysis and survey. The Theory of Probability and the Central Limit Theorem, born after the works of Pascal, Fermat and Bernouilli in the 18th century would set the foundations for statistics and polls theory, extending the early "intuitive" works of England's Graunt and Petty on population analysis one century earlier. In the US, polls went through newspapers to the people in 1824, when two newspapers, the Harrisburg Pennsylvanian and the Raleigh Star, organized "show votes" to determine the political preferences of voters prior to the presidential election of that year. The people had eventually a chance to express their voice. The growing attention to public opinion is illustrated by Abraham Lincoln's declaration: "What I want to get done is what the people desire to have done, and the question for me is how to find that out exactly." 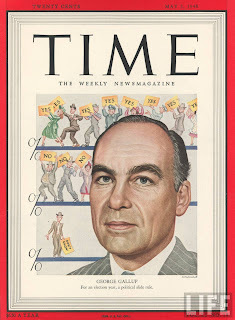 The next stage in the development of opinion polls came with the rise of social sciences and foundation by George Gallup of the American Institute of Public Opinion in 1936, bringing sociology and statistics into the public consciousness. Public opinion on virtually every political, social or economic issue of the day could now be heard. Polling techniques consist essentially today of proved sampling techniques and of correlation/significance intervals analysis. Little progress is now made on the analysis itself of public opinion, but the development of the internet, as the development of the printing press in its time, is now potentially giving opinion polls an even larger audience, as free as ever to express itself. It is encouraging to see today the birth on the internet of a new form of informal participative democracy, using channels outside of the insitutionnal frameworks, where debates can take place and every voice be heard. Athens, 5th century AD. A few thousand people are gathered on the Pnyx hill, overlooking the agora, hundreds of meters away from the Acropolis. Each attendant listens carefully to the speaker despite the tremendous heat. They all have their opinion on the question being debated, reflecting on their vote as responsible citizens. Some dare to express themselves in front of the imposing audience. The ones most involved in the debate make proposals of new texts to vote. But none of them realizes what is currently unfolding. None realizes he is witnessing the birth of a concept, main pillar of civilization, that men have fought for since 2500 years ago on the hill of Pnyx. A concept that has owed its continuity to the will and struggle of the people: Democracy. Around 6000 people are estimated to be part of the Ekklesia, voting every two weeks with raised hands on laws, budget or election of new Athens lawmakers and "Boule" members. All adult Athenians, born of Athenian citizens, could participate. They were probably sitting on the ground, each choosing his location freely on a 2,500 sqm. seating area opposite the stone speakers' platform, the "Bema". 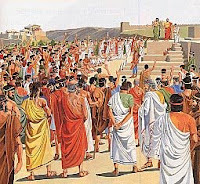 On the platform also seat the Prytanes (highest circle of Athens citizens) who until 378 call and preside to the Ekklesia. The board is composed of the head of the Prytanes, the herald and one secretary. Order is ensured by the Scythian Archers, armed with ropes dipped in red paint. Before the vote the herald would announce “Who wishes to speak?". The speaker, assuming the myrtle wreath, assumes the control of the audience. He stands on the Bema, seen and heard of all. The right of "Isegoria", of "equal speech" allows all to participate, and the right of Isopoliteia, "equal in politics", allows all to vote and take political office, granting power to the people. As a counterpart to this freedom, the speaker is liable for his words and exposes himself to heavy charges in case of abuse. The graphe Paranomon can punish whoever makes a proposal against the law, up to one year following the proposal. Although in the facts poor farmers don't have the time or means to go to the Pnyx or don't dare to, leaving the stage to prevailing Athenians from higher classes, the form of political organization invented by the City of Athens, Democracy - union of demos and cratos, the people and the power -, constitutes an exceptional model of representation, allowing citizens to exercise their political rights and to participate in public matters.